Have to drive there in a few weeks and wondering what is the best, most scenic route. Never driven out that way and according to the map, there's multiple ways to go along different interstates. Will take my time and may stop and do some sight seeing so any suggestions along the way are appreciated. Just go fastest route. All scenery is in the final 2-3 hours no matter which direction you come from. I kind of like going through all of Northern GA for what it’s worth. Thanks so much! I saw there's a couple of restaurants along the way that are supposed to be good. If you go through Atlanta take the I-985 route to US 23 as it is pretty and there is a restaurant with goats on the roof, but I can't speak for the food. Take Interstate all the way to Cleveland, TN. Hit 64 and don't stop til you get to Hendersonville, NC. Get on Interstate to Asheville. This will take you through the Ocoees and 64 from Franklin to Brevard is nothing short of amazing. Eat at Caffe REL in Franklin if you get the shot. 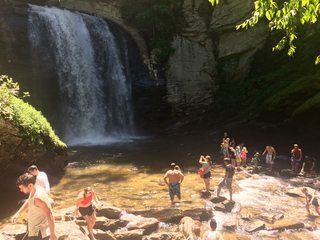 Highlands, Cashiers, Brevard are all amazing little towns. Other options to consider are US129 or Cherohala Skyway closer toward Knoxville and then from either of these going through Bryson City and Cherokee. US129 and Cherohala Skyway are enthusiast roads. Do NOT be like other fricktards from Louisiana that go up there. There are pulloffs, USE THEM. You are slow flatlanders, you need to GTFO of the way. Thanks so much, appreciate the food stops also. Will def try Caffe REL. Looked them up and it looks awesome! As Dam Guide says this is a good route among several options. At Brevard, rather than taking 64 to Hendersonville you can get on 280 which intersect I 26 closer to Asheville. That will take you right by Sierra Nevada Brewery if that interest you. Or, at Brevard you can take 276 into the National Forest and intersect the Blue Ridge Parkway; I think it is ~ 11 miles off of 64. That will take you by a couple of waterfalls, including Looking Glass & Sliding Rock. The BRP goes near Asheville to the east. Another option is to turn north at Franklin, Highland or Cashiers and then interest with 19 or 74 and take one of those into Asheville. If you decide to go farther north in Tennessee and take the Cherohala Skyway at Tellico Plains I think you may see more fountain views. 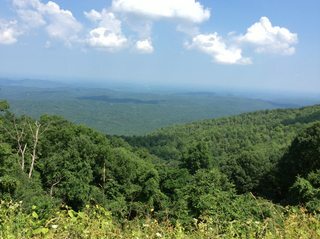 This was taken from a pullout on the Cherohala Skyway in June 2014. There were not many cars on the road that day. We did talk to a guy and his wife at this spot who were riding a motor cycle. 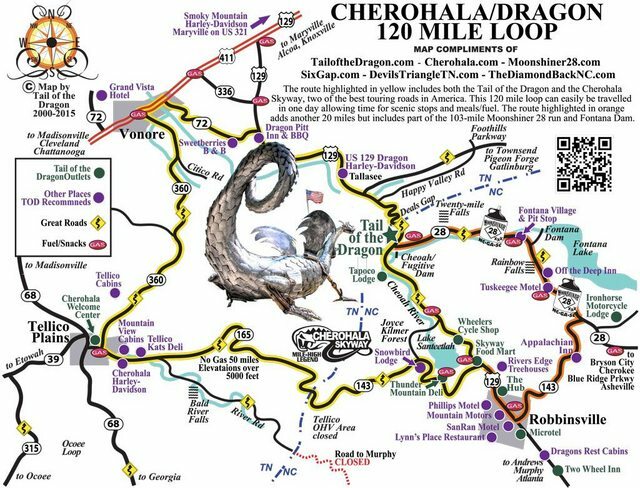 They were on their way to ride the Tail of the Dragon which is part of Hwy 129 a little north of Robinsville. I think they were from BR. Driving the Tail is probably too far out of your way unless you just have a lot of time to kill. I second that. Love north Georgia. The hills n scenery. Ate at Dillard House, stopped at Goats on Roof, Lake Rayburn? I think is awesome setting. Can’t remember all but stayed further north in VRBO cabin in mountains.